There’s nothing better than a cold cocktail and killer views in a tropical beach setting. So I set out to experience the ultimate rooftop bar hopping experience–all in the name of journalism, of course. My editor at Orbitz.com really had to twist my arm to get me to do this assignment (click here for that story). I went to 7 rooftop bars in 24 hours. But since I’m no longer an uninhibited 22 year-old with limitless energy, I divided it up between two days. Each bar on my list either had to actually be on a rooftop or situated high enough in the air to resemble a rooftop. Must be located either on South Beach or in the Brickell/Downtown area. Views were very important in my analysis (obvi). I didn’t include places in Coconut Grove (although I do like the Mayfair’s rooftop bar) or other parts of the city outside of high tourist traffic areas. I also didn’t include places where you had to be a guest of the hotel or a member of the social elite (ahem, Soho Beach House. Which I do like, but they don’t even let you take selfies there because of their super serious social media lock-down to “protect” the exclusivity for their members…whatever). It’s also worth mentioning that many travel writers have done similar Miami rooftop articles, but I wanted mine to stand out from the rest. So I actually went to each and every bar, ordered a drink on my own dime (well, except for one place and we’ll get to that) and snapped my own GoPro photos. I started my adventure on a Friday night with my partner in crime (the always charming and entertaining Jeremy Franker). My mission for the evening: hit up four rooftop bars in Brickell and Downtown. Bar has jaw-dropping views facing east and Biscayne Bay. Not many people know about this place, so it feels like a hidden gem. Happy hour runs from 4 to 7 p.m.
Veuve Cliquot champagne specials: $50 for a bottle at 5 p.m., $60 at 6 p.m. and so on throughout the night. It’s located across the street from the free MetroMover (which I wrote about and embraced), so you can save a buck on taxi fare or save your soles from too much walking. To drink: order the Kiss Royale with Champagne, Chambord, Grand Marnier with a sugar rim. The crowd: it’s mostly corporate groups at the moment and needs a serious infusion of young, hip Miamians. The outside bar area is a little small, so you’ll need to get there early if you want to beat out the business travelers for a table with a view. Hands down one of my favorite happy hour hotspots in Miami; runs 7 days a week from 4 to 7 p.m. The food here is a-freaking-mazing. And so are the cocktails. 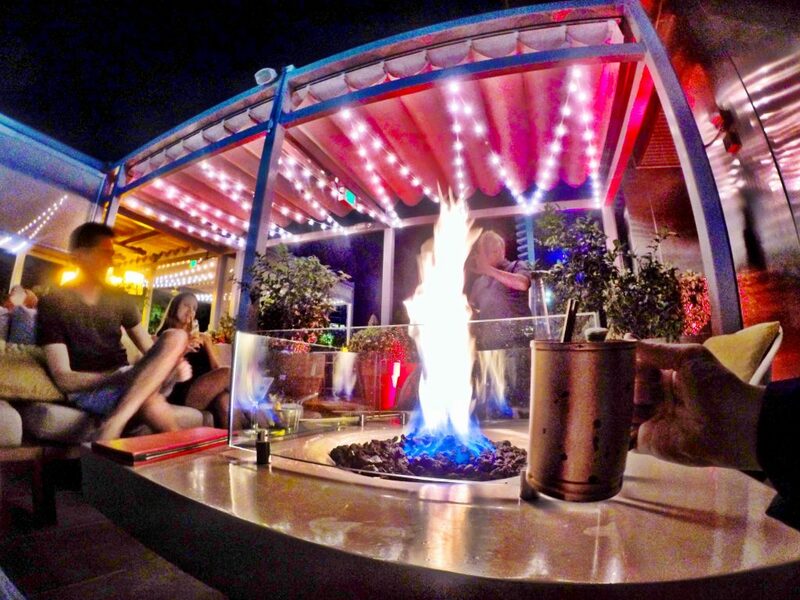 The indoor bar is a cool scene, but I like the outdoor loungy fire pits even better. You can even order s’mores! Not as many tourists come here, so it’s a great place for locals to chill out in a laid-back setting. It’s located next door to the Conrad, so it’s really easy to hit up both bars in one night. And did I mention, this is the Four Seasons? Enough said. To drink: order the Moscow Mule, it comes in a cool tin cup and it’s not on the menu. The view here isn’t quite as fabulous as the others on the list because you’d have to walk to the edge of the pool deck to really see much. There isn’t much outdoor seating (besides dining tables, where you’ll likely need a reservation), so you’ll need to work hard to get a spot on the white love seats by the fire pit. It’s debatable whether this is truly a “rooftop” bar because although the Four Seasons is currently the tallest skyscraper in Miami and this place is located on the pool deck, it’s only on the 7th floor. The views here are absolutely stunning: Brickell Avenue skyline to the south and Miami River plus Biscayne Bay to the east. The crowd here is very Miami chic and it’s definitely a trendy scene on Friday nights. Speaking of Fridays, the happy hour specials are pretty darn good: $5 drinks and bar bites at 5 p.m., $6 at 6 p.m., $7 at 7 p.m. and so on until closing. There’s usually a DJ spinning beats on Wednesday – Saturday. There’s quite a bit of seating throughout the pool deck. To drink: go for the sparkling wine on the happy hour special or a full-priced colorful martini if you want to go all out. While the “chase the clock” happy hour specials are good on Fridays, the prices aren’t that great on other nights of the week. On Monday – Thursday drinks are $7 for house wells, beer and wine from 5 to 8 p.m.
Music stops at 10 p.m., so this isn’t a place you go for the late-night party. Parking can be a nightmare at the EPIC Hotel and many people have to wait for what seems like forever for valet service. There are no other views like this in the entire city. It’s the 50th floor people! Get ready to dance the night away to high-energy beats, usually hip-hop and house music. Unlike other Miami area clubs, I didn’t get as much of a pretentious vibe from FIFTY. I think it’s because the crowd was a good mix of people. This is a great spot for a night out with the girls. The club is only open on Fridays and Saturdays and not open during the day. To avoid standing in line, either reserve a VIP table or get there when the doors open at 11 p.m.
UPDATE: W Hotel bought the Viceroy, so the jury is still out on what’s happening to the 50th floor…I’m sure they’ll transform it into a hotspot. The next day, which was a Saturday, we set out to visit another four rooftop bars, this time on South Beach. But alas, Spring Break crowds and insanely horrible traffic limited our undertaking to only three bars. It took us an hour to get from downtown to the beach. So sadly, the rooftop at Townhouse Hotel got cut. And I still haven’t been there to check it out, so I have no idea if it’s worth the trip or not. It’s also interesting to note that the difference between the city rooftop bars and the beach rooftop bars are quite striking. On the beach, the vibe is prototypical South Beach: lots of drunk, scantily-clad tourists living it up on vacay. And who can blame them? The views are pretty good, but you have to walk over to the oceanfront side to take it all in. The 1970s-style architecture and Art Deco style brings out the South Beach glam. To drink: Order the Naked Taco Signature Red Sangria, inspired by the Mexican restaurant downstairs called the Naked Taco (which has great food). It was too touristy for me. They have hookahs for rent (which to me is kinda weird, but I guess others might like that). Hopefully Martin is working the bar, he was super cool and helpful; the other guy (whoever he was) not so much. Views of Ocean Drive and the main downstairs bar are awesome. Located within walking distance to HIGHBAR, if you want to bar-hop. There’s usually a DJ spinning beats; it’s definitely a high-energy party atmosphere. To drink: a mojito. Pretty simple. It doesn’t get any more touristy than the Clevelander, but then again, you already know that and you still go. The rooftop bar doesn’t open to the public until 7 p.m. Drinks are pretty pricey and gratuity is usually automatically included. 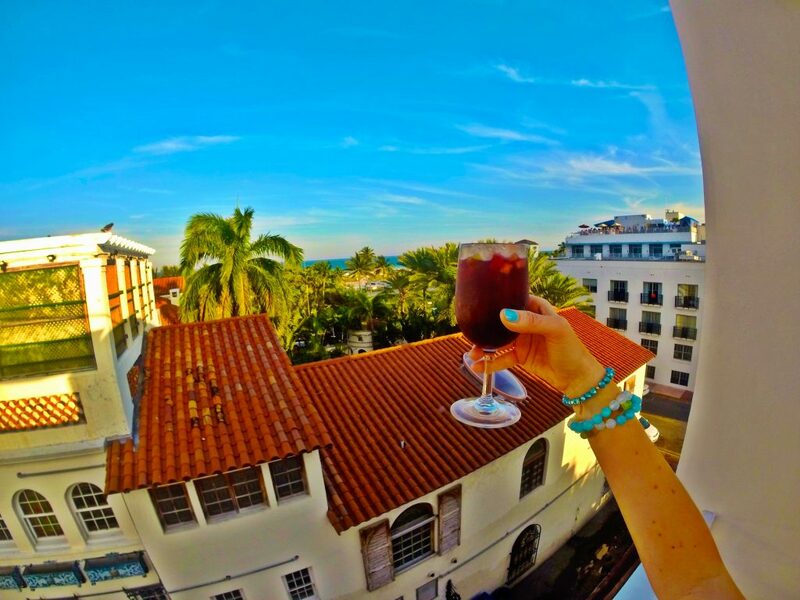 The Miami Beach views here are seriously drop-dead gorgeous. Unlike the Clevelander and Dream Hotel, Juvia is not a touristy locale, it’s a hotspot for well-heeled locals. The menu gets rave reviews from every foodie in town. The location on Lincoln Road can’t be beat. It’s close to tons of boutiques and outdoor cafes. To drink: try the Purple Rain. To my surprise, this isn’t a great spot to watch the sunset. The restaurant faces mostly east. If you want a table, then you need to make a reservation. Food and drinks are expensive. The entrance to Juvia is a private elevator located on Lennox. Well, that wraps up the tour! 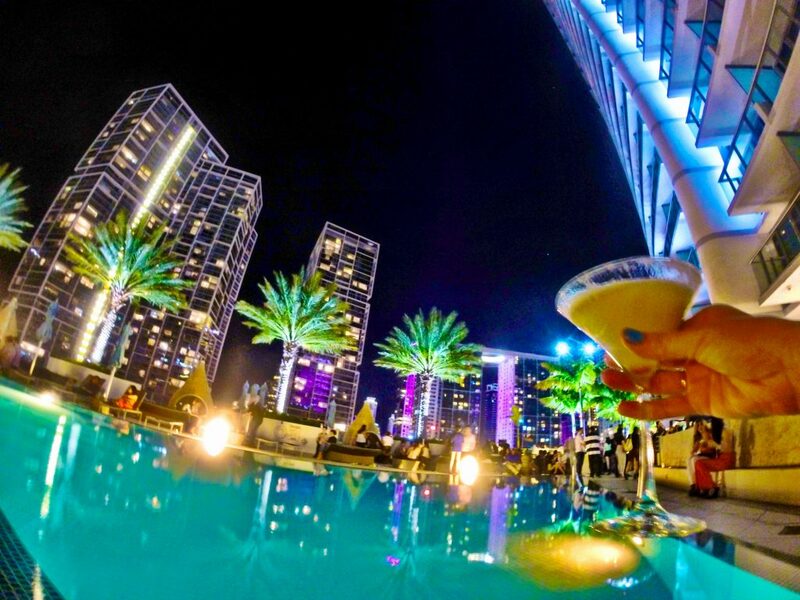 Have you been to any of these rooftop bars? Are there any I missed that you think should be included? Situated atop the Langford Hotel in Downtown, Pawn Broker is Miami’s newest hotspot for local young professionals, especially during happy hour (Monday – Friday from 5 to 7 p.m.). Nosh on bites from Pubbelly Group and sip on craft cocktails like The Pawnbroker (a spin on the Old Fashioned) and the Lady Lindy (a smokey-meets-floral libation). 121 East 1st Street, Miami, FL 33131, pawnbrokermiami.com. Crowds have been flocking to Sugar ever since it opened in the brand new EAST Miami Hotel inside Brickell City Centre. The 40th floor rooftop bar and garden offers pricey cocktails and Asian tapas. And you might want to show up early to avoid standing in long lines. 788 Brickell Plaza, Miami, FL 33131, east-miami.com. This makes me want to fly to Florida. Great photos! I absolute love your post. I have been to most of these rooftop bars and you really picked to best ones. I look forward to more posts like this. It just reminds me why I love Miami so much. Thanks! 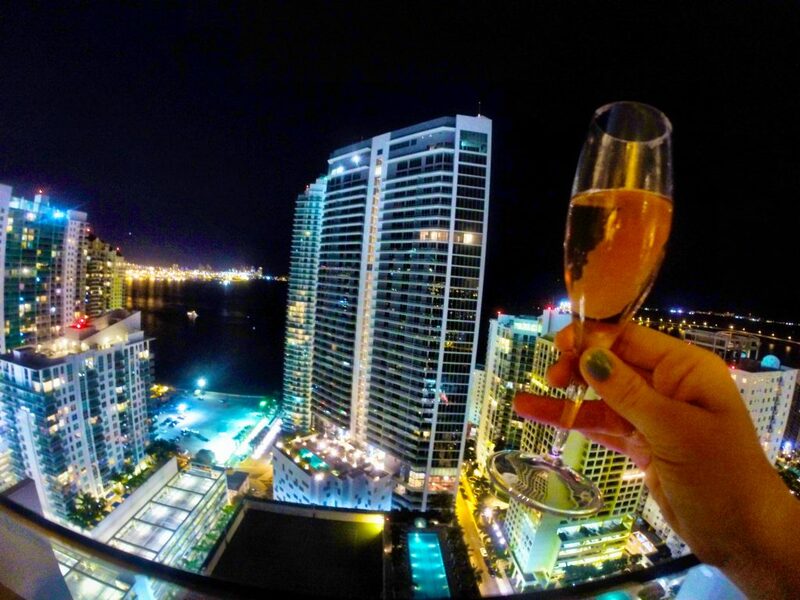 The best part of hanging out in Miami is soaking up the view. That’s why a few of these spots are my fave. Glad you like them, too! Thanks so much for this awesome listing! We used it with a friend while bar hopping in Miami Downtown, and LVL25 and Area 31 were both great tips. Hi Jenni, so happy to hear that! Both locations have incredible views. Hope you enjoyed your trip. Awesome post,. love the easy explanations about each place. The photos are fabulous. 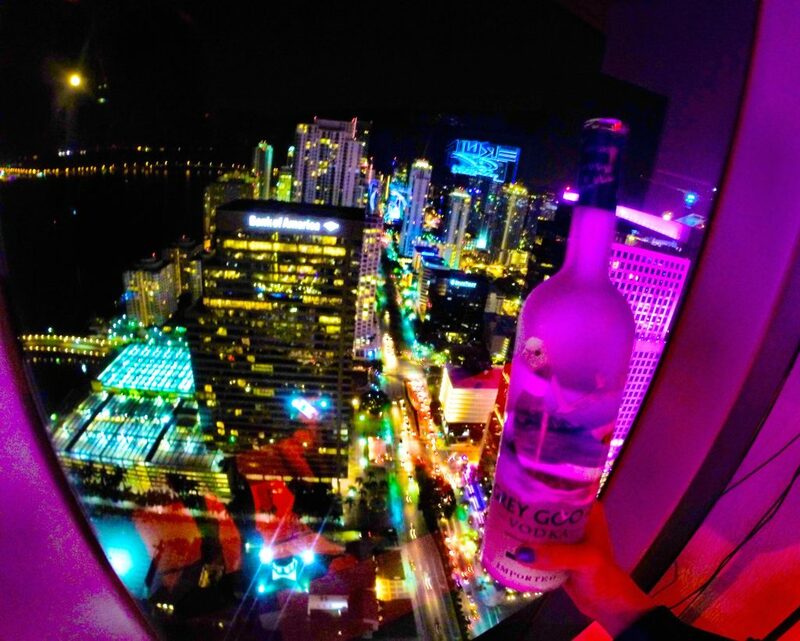 Its on my bucket list to do a Miami-rooftop-bar-hopping now. 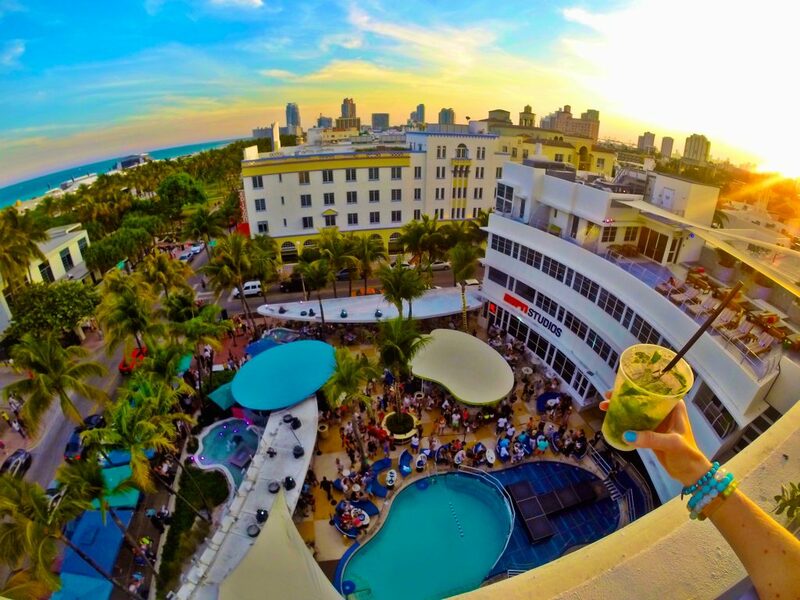 The Clevelander Hotel Terrace was my fave and you seemed to be holding the right kind of drink. Hi German! Awesome, glad to hear it. 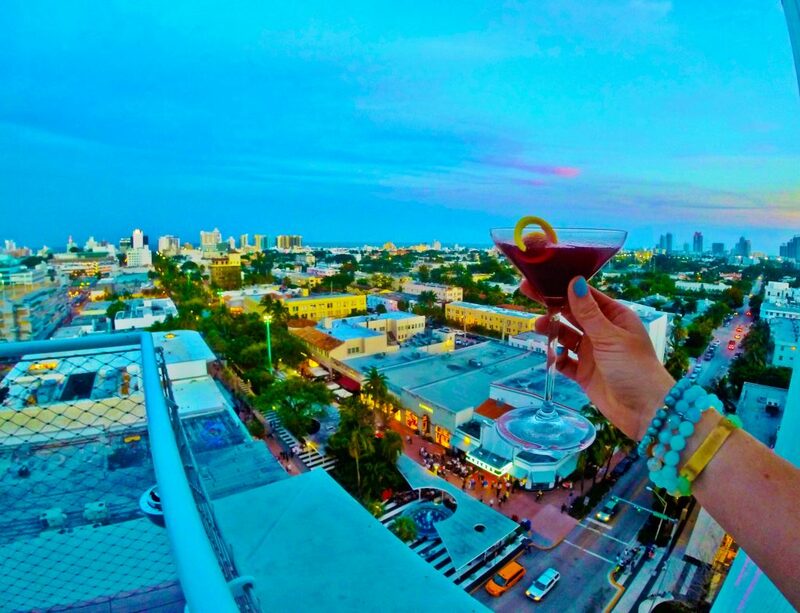 Miami has it’s fair share of rooftop bars with killer views, so it’s the perfect photo opp for a blogger like yourself!